"Nelson's straightforward reading works well with Adler's simple biography of Harriet Tubman, a Civil War spy, nurse and emancipator of slaves. The production is made richer by a few well-placed sound effects and rather poignant singing of a coded song that Tubman used to alert slaves of her presence. Samuel Byrdy's colorful illustrations enhance this solid intriduction to an important historical figure." "This solid entry in David Adler's picture book biography series transfers smoothly to audio. With a well-paced, precisely spoken narration by Gail Nelson, this very truncated story of the life of Harriet Tubman-from slavery to leader of the Underground Railroad-relates the struggles and the dangers she endured. Sublte background noises add to the competent storytelling and a couple of brief songs are beautifully sung. In-text quotes by Harriet Tubman are read in different voice with a southern accent, making it seem as though Tubman is speaking. An i mportant dates appendix is also read aloud. One side of the recording has page-turn signals. A spare, yet important audio production." "Gail Nelson is an unobtrusive narrator who lets Harriet Tubman's deeds and personality speak for themselves. And speak they do! It is remarkable that Adler includes so much information in such a slim work. From Maryland plantation to Underground Railroad conductor to Civil War nurse to community leader in Auburn, New York, Tubman had a life of remarkable deeds and personal fortitude. Nelson's pacing is such that each event is discrete; her clear, forceful words underscore the import of what is occurring. 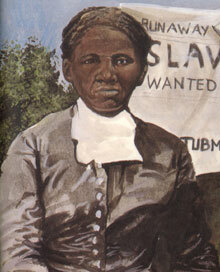 It is unmistakable to Nelson and to the listener that Harriet Tubman was a person who made a difference in her world."